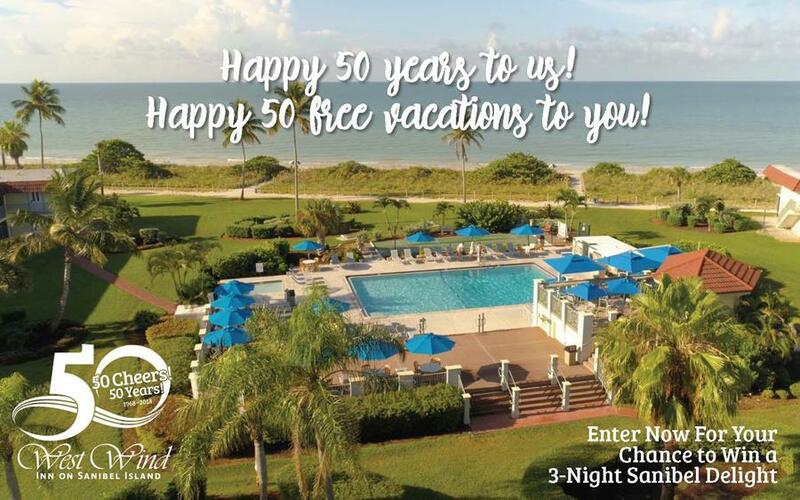 Win 50 Free Sanibel Island Vacations to Celebrate 50 Years of West Wind Inn. What’s the perfect give to celebrate a 50th anniversary? At West Wind Inn, we think it’s sand — and to celebrate our 50 years of warm, wonderful island hospitality, West Wind Inn is thanking you with 50, Three-Night Sanibel Delight vacation packages that you could win throughout the year! It’s easy to enter! Just click on the image above or click here to enter! All entrants are then automatically eligible to win one of 12 Sanibel Delight vacation packages we’re randomly drawing on April 1, July 1, October 1 and January 1, 2019! Plus bonus, at our January drawing, we’ll also select one lucky Four-Night Super Stay winner, plus one lucky Five-Night Grand Stay winner. You and your friends can also enter by wishing us “Happy 50th Birthday!” on our Facebook page here! Imagine you and your guest or loved one enjoying one of TripAdvisor’s top-rated Sanibel resorts (and the Official Beach Resort of Sanibel Island). That means you’ll bask in all the fun and sun of 500 pristine, private Gulf of Mexico beaches. A gloriously delightful heated pool and gorgeous pool deck, complete with food and beverage service from our Upper Deck pool bar. You can enjoy free bike rentals, free paddeboard rentals, free standard Wi-Fi, free parking and free blue skies and sunshine! Plus if you’re a foodie, there’s no better place to start the day (or enjoy a delicious lunch or fab dinner) at our Normandie Seaside Cafe. Enter now and be SURE to spread the news among all your family and friends across Facebook, Twitter and your other social media accounts. The more winners you know and can enjoy a Sanibel vacation with, the better! Good luck and remember, enter now! Oh, and if you just can’t wait, book now to enjoy great savings and ONE FREE NIGHT WITH THREE starting soon with our preseason sale on now! Welcome to the Official Beach Resorts of Sanibel and Captiva Islands, Florida. Sanibel Captiva Beach Resorts is a leader in Southwest Florida lodging management and marketing. 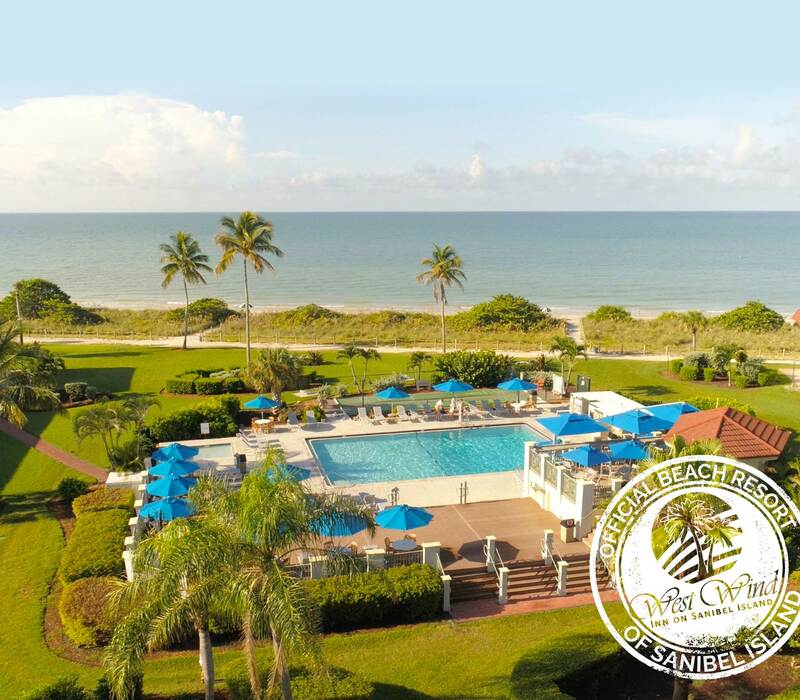 Sanibel Captiva Beach Resorts offers four outstanding beach resorts, numerous restaurant and entertainment venues and options, marinas, spa, plus recreational opportunities to enjoy. For the best Sanibel beach resorts and best Captiva beach resorts, count on Sanibel Captiva Beach Resorts, LLC. Enjoy Exclusive SCBR Guest Ticket Discounts! Copyright 2018 Sanibel Captiva Beach Resorts LLC.